@rachelandrew https://codepen.io/rachelandrew/pen/KXGbQo/ Items start by trying to display at max-content size. Space is reduced according to the ﬂ ex- basis. In this case the size of the content. and taking space away. Grid starting at min-content and adding space. @rachelandrew This is not exciting . But it will let you do exciting things. @rachelandrew Why so complicated ? @rachelandrew It is all just lines . @rachelandrew grid-area: content / content / content ; https://codepen.io/rachelandrew/pen/QqJbyB/ grid-row-start grid-column-start grid-row-end • grid-column-end is set to the value used for grid-column-start, which is ‘content’. 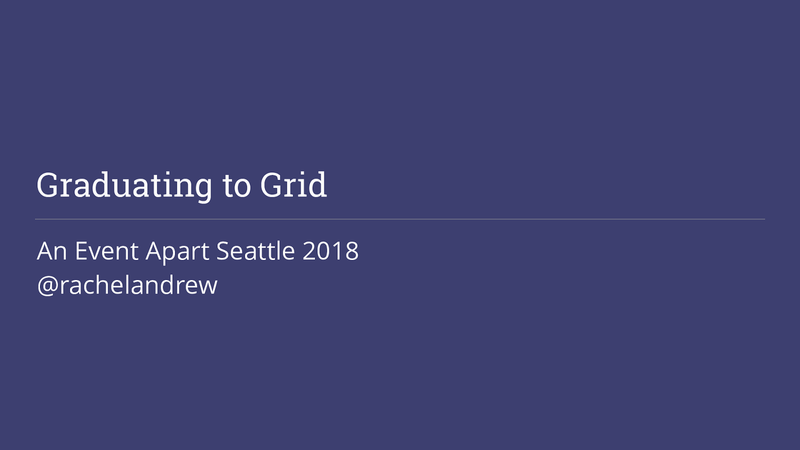 @rachelandrew grid-area: content / content ; https://codepen.io/rachelandrew/pen/QqJbyB/ grid-row-start grid-column-start • grid-row-end is set to the value used for grid-column-start, which is ‘content’. • grid-column-end is set to the value used for grid-column-start, which is ‘content’. @rachelandrew You have real choice for the ﬁrst time. had CSS in their codebase written 10 years or more ago. @rachelandrew Other layout methods still exist . @rachelandrew https://codepen.io/rachelandrew/pen/ZXNYob/ Floating the image means the text wraps round. De ﬁ ning a grid on the container means we don’t get the wrapping behaviour. @rachelandrew https://codepen.io/rachelandrew/pen/RLmNvY/ Using column-width of 200px means we get more columns if there is room, fewer with less available width. Multi-column layout splits content into equal width columns. @rachelandrew https://codepen.io/rachelandrew/pen/OxYVmL Flex items with the value of justify-content set to space-between. I also use ﬂ exbox to centre the word in the circle. @rachelandrew Do you want your project to inherit the CSS issues of the rest of the world ? @rachelandrew Working with less capable browsers. These may not always be old browsers . @rachelandrew A lack of understanding on one side. A lack of conﬁdence on the other. of survey respondents cited IE11 as oldest IE supported. @rachelandrew Many browsers without support for Grid and other new CSS at this point are mobile browsers . @rachelandrew Stop looking for polyﬁlls and shims. They will make the experience worse for less capable browsers and devices. @rachelandrew Using Grid rather than loading a big framework can help create a better experience even for browsers that don’t support Grid . use CSS to ask if the browser supports a feature before using it. @rachelandrew Create complex layouts for browsers that support them with a few lines of CSS . @rachelandrew Making the web available to everyone . That’s exciting. Such a great presentation @rachelandrew! You helped me to better see what I was struggling with in CSS Grid. Just listened to @rachelandrew articulate all the nuances of CSS Grid at @aneventapart Seattle. How CSS is progressing technically is incredible, but the part that resonated with me most is encapsulated in this quote: "Making the web available to everyone. That's exciting"